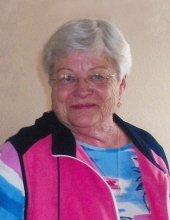 Regina Robbins, age 79 of Breckenridge, passed away Tuesday, February 5, 2019. Graveside funeral services will be held at 2 p.m., Sunday, February 10th at Yellow Fork Cemetery with Rev. Charles Kuhn officiating. Interment will follow under the direction of Morehart Mortuary. Visitation will be held from 4 p.m. to 5 p.m. on Saturday, February 9th at Morehart Mortuary. Regina Dee Robbins was born October 2, 1939 in Stephens County, Texas on the old homeplace to parents, Kenneth Wayne Robbins and Dorothy Faith Carlton Robbins. On June 24, 1956, she married Robert Lynn Thompson in Albany and they had two children during their union. She graduated from high school in 1958 and later got her cosmetologist license in 1968. Regina worked as a cosmetologist, was self employed in ranching, and previously owned and operated G’s West Side Laundry in Breckenridge before her retirement. Regina was preceded in death by her parents; one son, Robert Wayne “Bubba” Thompson; her brother, Wayne Carlton Robbins; and one aunt, Sarah Ellis. She is survived by her son, R. Kent Thompson and companion Tracy Patterson of Breckenridge; and two granddaughters, Kallee Dee Thompson of Breckenridge and McKenna Noel Thompson of Columbia, Missouri. The family would like to thank Linda and Bob Moss for the 18 plus years of friendship and loyalty to Regina and the entire family; the family of Mitchel Sullivan, her partner in crime, for loving her so much; and special thanks to her nurses and caregivers, Angela Cortez, Jessie Martinez, Lachelle Tidrow and Cassidy Harrison, for their wonderful care. In lieu of flowers, memorials may be made to Meals on Wheels and may be left at Morehart Mortuary. Condolences may be left at www.morehartmortuary.net. "Email Address" would like to share the life celebration of Regina Robbins. Click on the "link" to go to share a favorite memory or leave a condolence message for the family.